If you're feeling overwhelmed, a homeschool schedule will really help! At first, you may think this is an added 'chore' to do in your homeschool planning, but really it is a way to view your day - to have a overall picture of what things might look like ... and as you plan, it will all seem so much more doable. Trust me - follow the steps and create your own homeschool schedule. When will the formal learning take place? What does a homeschool day look like? How will I plan around different children? Let's look at the nitty, gritty details to help you work out how to homeschool. Don't freak out at the detailed schedule below - this may be way too much information for some people, but for others it may be a life-saver to have it written out in a detailed way. 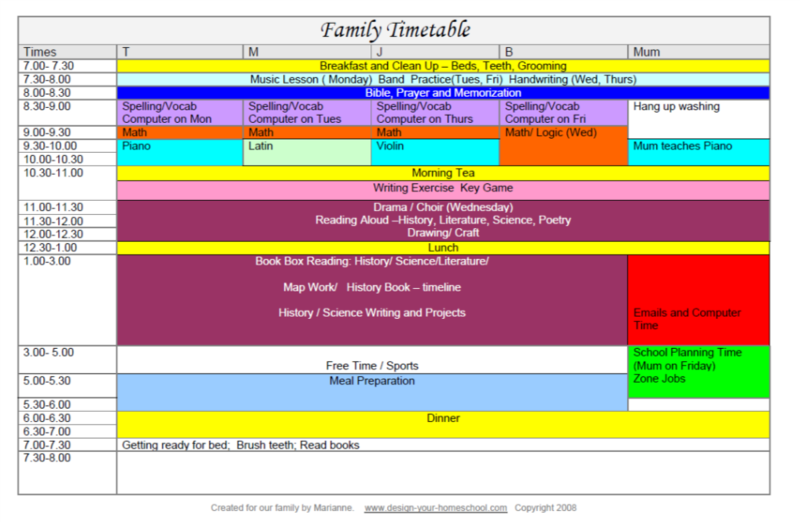 Example of a detailed Family homeschool schedule when managing multiple children. A homeschool schedule will look different for each homeschooling family depending on the number and ages of the children in the family and what you will try to fit into your day. If you have preschool children, please visit my page specifically about setting up a homeschool preschool daily schedule. This includes a sample homeschool schedule for little ones. Some families prefer to have a loosely defined schedule written in big time slots with general titles. 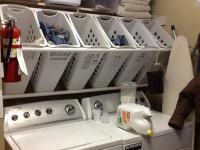 It gives a general overview of what the daily routine looks like. Followed by history projects, writing, art projects which stem from our reading. Older children continue if needed. Purchase and download this simple blank template which you can customize to suit your family. There are 2 pages in the download. Everything can be added around the meal times and is a simple way to have a plan without feeling too overwhelmed. 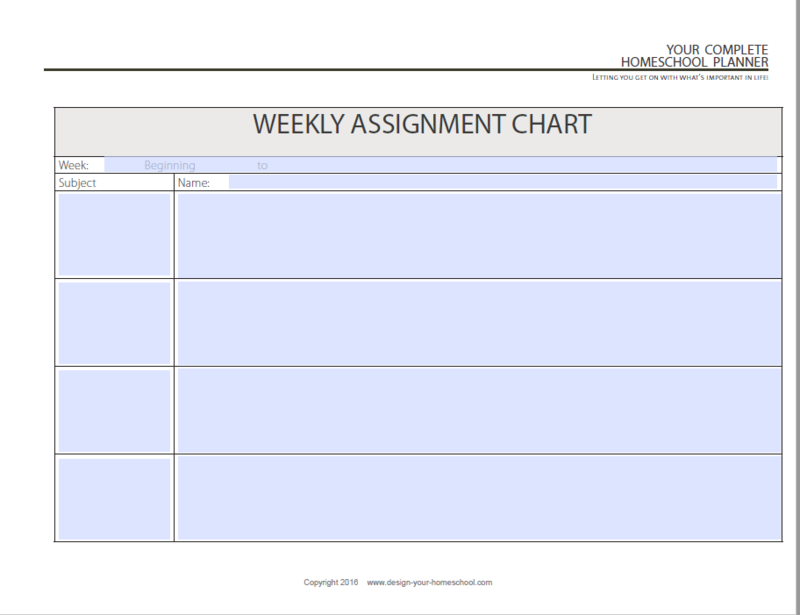 The second template allows you to add times and a place to schedule weekly activities. At times, especially if you are homeschooling a few children, you may want to divide your day into 30 minute breaks. I have done this when I need to work out what each child is doing as well as dividing up resources in the home (music practice, computer time etc). Click here to view my homeschooling schedule as an example. View some examples of homeschool routines in table format on this page. If you prefer to write a detailed plan, follow the instructions below to build your own homeschooling schedule. 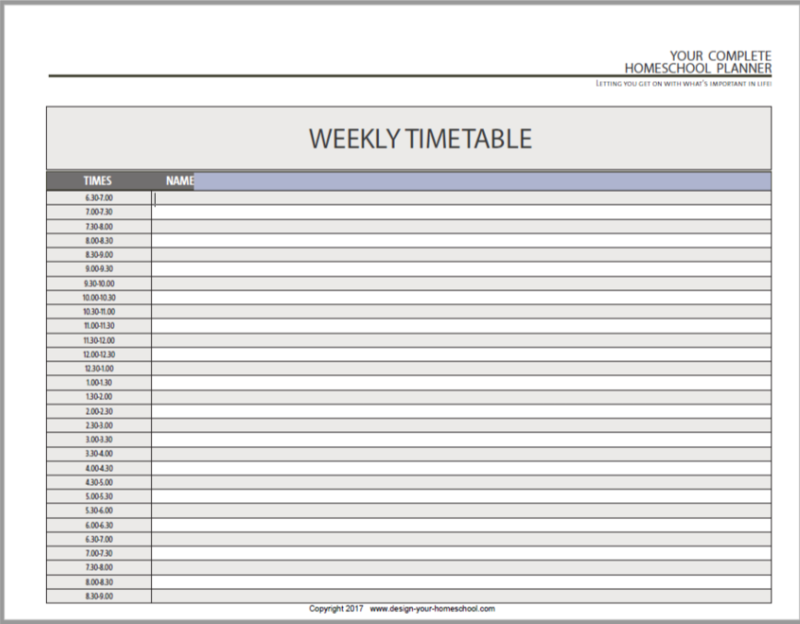 By doing this you will be building a homeschool schedule which will suit most days. You will need to alter this schedule for the days you have library visits, sports practice and so on. Firstly make a chart divided into columns and rows. The rows are increments of time and the columns are for the children's activities as well as one column for you and one to write in the time. Write down the time in the left column. Write it in 30 minute increments from the time you get up into the far left column. You will fill this chart with coloured slips of paper which you can move around until the schedule works. Now choose different coloured paper for each child and yourself. Divide each sheet into 30 minute increments also and write down what each child needs to do. Include sports practice, outside classes, chores, and all their subject areas. Do this for each child and also for yourself. Now, cut up all the coloured paper. If a class or lesson is longer than 30 minutes cut it out as a 1 hour - 2 hour block or whatever is appropriate. Start by putting in regular, non-negotiable things like meal times, bed on each person's column. Add sports practice or visits which you have outside the home every day. Remember this is your general homeschooling schedule. If Thursday is your day where you go to the library and have other excursions, you will need to alter this general timetable to suit. Next, add Subjects which you do as a family - Bible reading, Memorization/ Circle time, Reading aloud, Science, Unit Studies, Homeschool History, Art, Projects - as much as possible. Remember, you don't have to do each subject every day. (Use the same time slot - and add History/Science/Art according to your own judgement.) Add these coloured papers onto each column including your own. Now add Subject areas in which you need to help a child on an individual level. (Home school Math, Spelling) Add it to your column and to the column of the child you are helping. What can the other children do while you are helping this one child? (Quiet reading, TV show, computer program, box of toys/puzzles, online homeschooling option) Add that to their column. Continue by adding subjects which require your help on an individual level and fill in tasks which can be done independently in the columns of the other children. Keep juggling until it makes sense for your family! Continue to play with the schedule on these slips of paper until you have a timetable that works. Then write or type out your schedule. Once you have worked out your homeschooling schedule, write it out. Make a large chart for everyone to see and put it on the wall. Show everyone what it all means. Perhaps your children would like a smaller copy in their work areas. 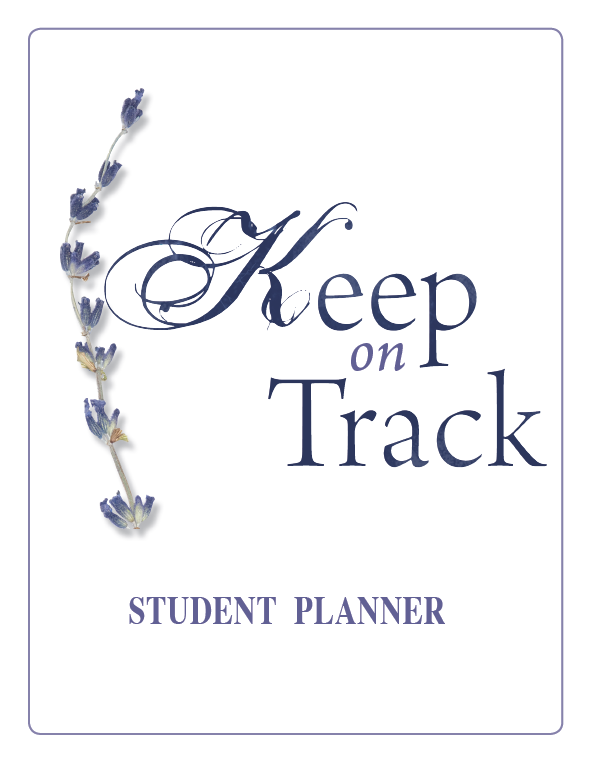 Add a copy of the plan into your own homeschool planner. 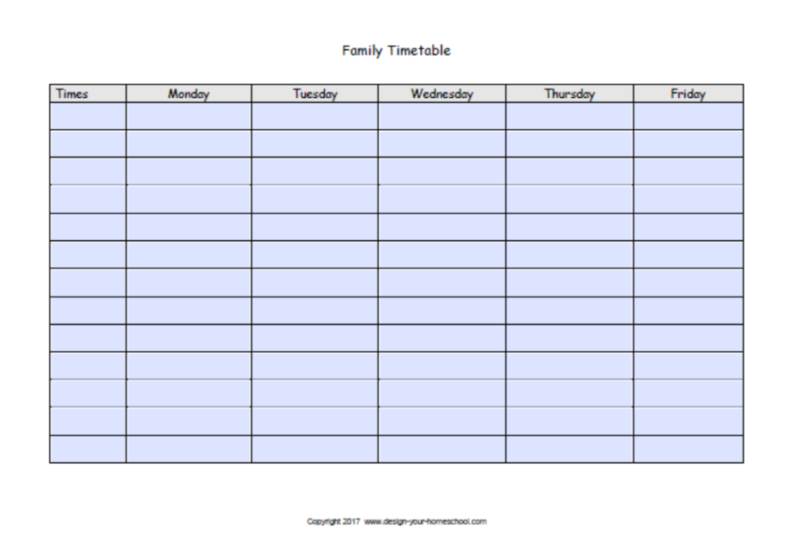 Add the plan to any of these customizable homeschool schedules. Once you have bought and downloaded these pages, you can edit them as needed - print off as many copies and keep changing it as life changes, children move into different activities etc. 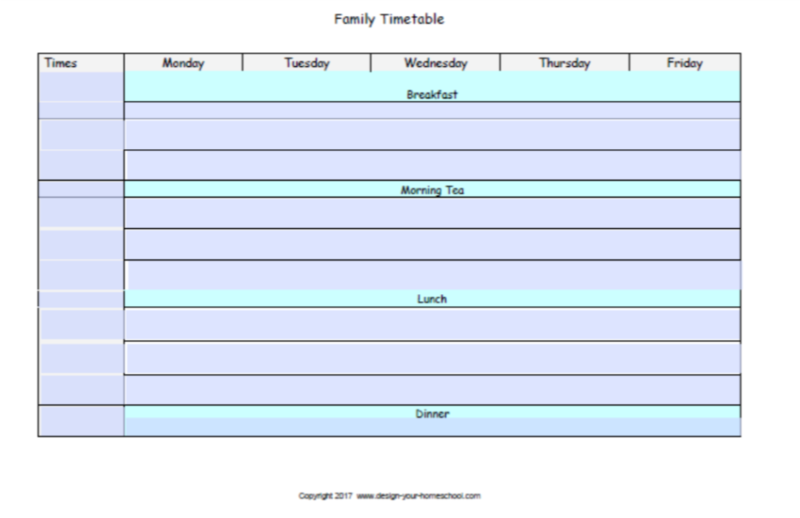 The Family Homeschool Schedule (as above) has 2 pages ($0.95) - a daily chart and a weekly overview chart. 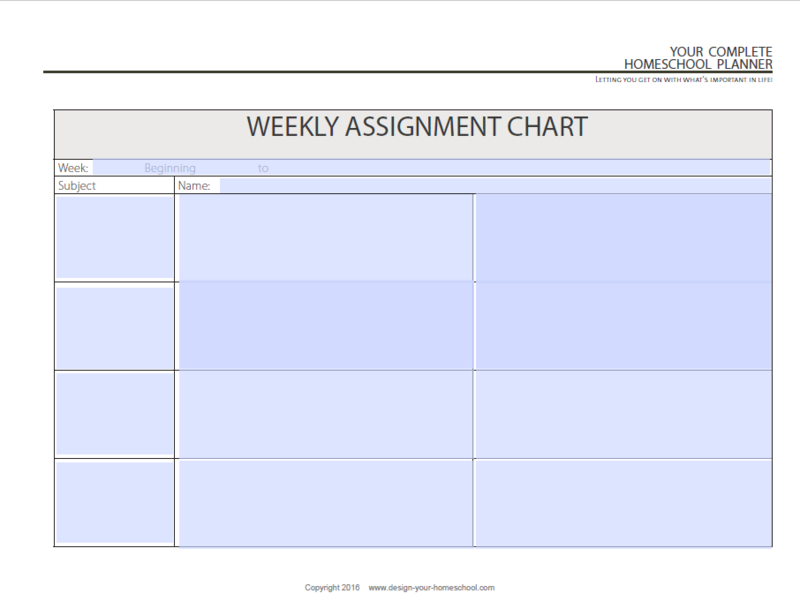 The Weekly Assignment Charts ($0.95 each) - have large time-slots for tasks to be added. The second one is available for 2 children. Now, how do you make homeschooling schedules work? Be consistent and stick to the plan! Set reminders in place. Use a timer and verbally remind your children - "You have 10 minutes to finish you math and then it's story time." Reward early finishers with a fun game or time outside. On the flip side, consequences for laziness would require work to be finished in their own free time or as you see fit. Team up older children with younger children - for story time, play time to free up your time to work independently with one child. Keep your afternoons as free as possible. If the schedule is not working, rework it. Give more time to the areas which are tight, shuffle the subjects and make a new plan. A Homeschool Planner should be as comprehensive as possible to eliminate the need for other diaries and organizers. It should be a tool to help you prioritize your life and pursue your homeschooling goals. A Homeschool Planner is as unique as each family. It does not need to be a strict 15 minute timetabled account of a homeschooling family, driven by a over-conscientious mother. It is a written expression which reflects your home. 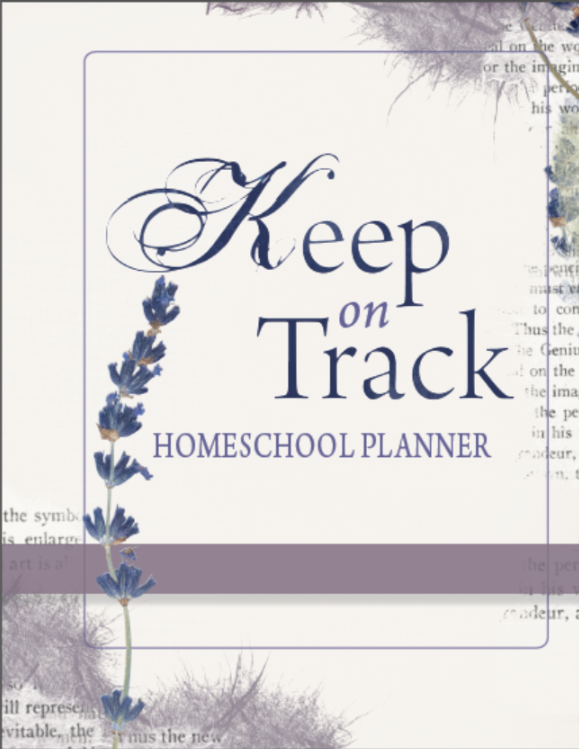 Whether you homeschool by using homeschooling schedules, in unit studies, in a natural learning approach, using your own eclectic family philosophy, it is a place which allows you to journal, record experiences, add comments, write in assignment charts, keep track of personal and family events, as well as helping you run your household in regards to chores, menus and groceries. A Homeschool Planner can be as simple as your require. 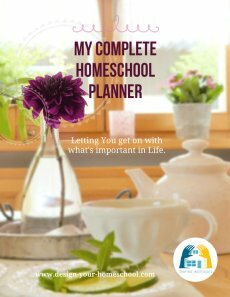 But, I believe that the time you spend now in organizing your own Homeschool Planner will be the time you save every week the whole year through. A Homeschool Planner is a place where you can begin to write your goals. It is also a place where you can organize parts of your daily household and homeschooling life to reflect the big picture goals and the priorities. Speaking from my own personal experience, I need to write down my thoughts and allocate space in my day to enable myself to keep my priorities in balance. Find out more about Homeschool Planner Options here. Check out other homeschooling schedules here. Add your own.